Joshua Klejka, 17, has been mushing with his siblings since he was four, but never had his own team until he was ten. 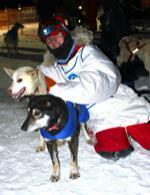 He has run the Akiak Dash as well as other races, including the 2012 Jr. iditarod when he finished eighth. “I am the youngest boy in the Klejka famiy. My older sister, Jessica, won the Jr. Iditarod in 2008 and my older brother, Jeremiah, won in 2012. An eleventh grader at the high school in Bethel, Joshua participates in cross country, band, choir and drama. He also enjoys running. He plans to attend UAF and to continue mushing.